Today more and more people are concerned about their physical appeareance to the point that it has become a social phenomenon that involves a large amount of the population. Surgical procedures for beauty purposes are becoming more frequent and aesthetic medicine is becoming a media sensation. That’s why people, especially those that are not familiar with these kinds of procedures, are doubtful, scared or skeptikal about them. 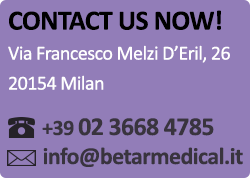 Betar Medical clinic provides high quality beauty aesthetic treatments held by qualified personnel that can establish a professional and trustworthy relationship with each patient. Our vision of beauty is far from the “ideal” and pre-built models drawn by media. Betar Medical aims at providing each patient with individual treatment plans and fulfilling their requests according to their preferences. This idea of beauty inspires us to promote among our patients a healthy physical appearance that reflects overall body wellness. Our ultimate goal is to provide quality service in a welcoming environment where each patient feels that their therapeutic treatments actually represent a moment of self-care. The bonds we establish with our patients allow us to openly discuss the methods of our treatments, the risks and potential side effects, and most importantly, realistic expectations. Come visit us or contact us to receive a free consultation about our asthetic treatments and surgical procedures. We will gladly answer all your questions related to: methods, asthetic treatments costs, body & face treatments, specialized therapies of our multispecialized center and more. Our prices depend on the following factors: treatment type and involved equipment, skin imperfection type, the patient’s condition and their goal results. Since every patient has different issues and goals, we don’t provide a specific price list, but we offer customized treatment packages according to every patient’s aesthetic needs and budget. Our goal is to provide effective therapies as well as clear and moderate prices.